Great frames, exactly what I was looking for! he 10 frame set has 5 different outside frame sizes with each frame having one of 3 photo display sizes. The sizes are: (1) 11 x 14 matted, photo display size 7.5 x 9.5; (2) 8 x 10 matted, one photo display size 4.5 x 6.5 and one having two photo displays cut in - each 3.5 x 5.5; (1) 7 x 9 frame matted, photo display size 4.5 x 6.5; (3) 5 x 7 frames unmatted, photo display size 4.5 x 6.5 and (3) 4 x 6 frames unmatted, photo display size 3.5 x 5.5. The sawtooth hanging hardware is already installed on the back for both portrait or landscape style pictures. Hang your pictures using a design that accentuates your decorating style or use the hanging template that comes with the set to make it easier to place your photos in a perfect collection on the wall. The strong structural shape of the Bordeaux frame profile is a classic look that won't date and compliments many decorating styles like country, classical, deco, eclectic, European, and traditional. In addition, a beveled off-white mat is included in 4 of the frames including one that has cut outs for two 3.5 x 5.5 photos. Dimensions 3.8 In. X 20.7 In. X 17.8 In. I think I would have really liked this set but it is not like what’s pictured. They all came the same color, a flat white and I really wanted the greys and white washes, etc. thought it was really cool with the different sizes and colors but since it’s just one color, I returned the item. Frames came in a box, organized and individually wrapped. Also, there was a cutout to help you arrange the frames in the format in the photo. That was helpful, although I didn't end up using it because I integrated the pictures with other photos. Overall, we are happy with the purchase. The frames look nice, and they add great variety to our family photo wall. Absolutely love it. The frames are well made and come in 3 coordinating colors: whitewashed white, tan, and grey. 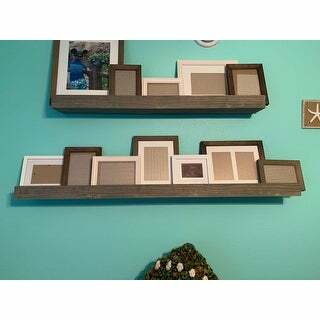 The template provided makes it very easy to hang the frames in an interesting arrangement. I used the frames for travel photos and added a stenciled quote below the photos. The wall is so interesting and provides many wonderful memories. The template makes positioning and hanging the frames a breeze. The only issue is that I discovered after hanging up the frame set is that 3 frames were missing and only 7 were included. We used these for a photo ledge and they are the perfect fit. Great quality. I appreciated the various styled. Again a great way to display pictures and moments! They are nice frames, with the color of the frames in the picture I was hoping they would be multi-colored. They are all Gray. Frames are a good quality and come with a template that makes arranging/mounting them very easy. Might suggest either including frame measurements (including viewable area/matte measurements) on each individual frame. Or an insert that includes measurements/quantities/photo orientation of each frame. Overall very happy and pretty easy to turn a blank wall into a memory wall. Bought 3 sets of these frames for an oversized gallery wall, and I’m so happy with how they look on the wall! The frames are easy to hang, lightweight, and come with a template for arranging them (I didn’t use it, but could make hanging even easier). They are a little thin and there were places where the wood of the frame is splintering slightly, in my mind this adds to the distressed look, but be aware if you’ll be bothered by that. I ordered this is in the coastal color set. I actually didn't use all of the frames together (I took some of them and used them with another gallery wall in our house), but what was nice is that the set came with a template to assist with hanging. Just a forewarning that the frames in this color set have a bit of a distressed look to them (mainly the blue ones). I love the varied sized picture frames from large to small! The frame colors are consistent looking so the picture wall looks great! Received many compliments on the frames. The frames were beautiful! They arrived very well packaged as well. Unfortunately, I ordered the wrong color for my needs. However, they did arrive perfectly and if I had a spa e for that color, I would have loved to have kept them. The frames came shipped in a box where they were very well protected, the frames look expensive and are made of real solid wood. Three different shades and comes with a pattern. These are beautiful and so nicely made! The sizes and colors are great they are just as advertised. I received them today super fast shipping, packaged extremely well . I am very pleased and will be reordering as a gift for a friend! "The product specifications indicate that the photo display sizes are 0.5-inches greater than standard sizes. Is this accurate? Will a standard 4x6, 5x7, or 8x10 photo have a half inch gap from the mat?" Standard photo sizes (4x6, 5x7, and 8x10) will not have a gap from the mat. Liked that it was different sizes and colors! New project in living room. good price. 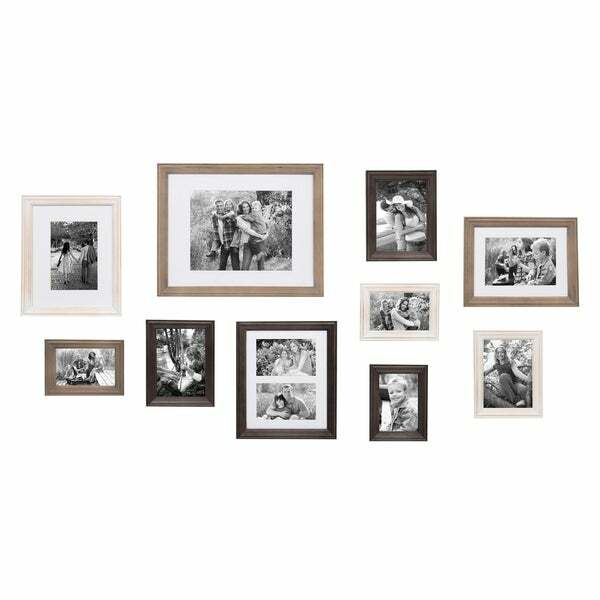 "Do these frames include the farmhouse, whitewash and grey frames or only the grey color frames?"